According to Billboard Top 100, these are your hot top ten for February 13, 2016! In tenth place, we have, “Me, Myself, and I” by G-Eazy and Bebe Rexha. This is a new song to the top ten, eliminating “Here” by Alessia Cara from the charts. Ninth place is “Roses” by Chainsmokers. Too bad; this newer song was only number six last week, but has gone down to ninth this week. Number eight is “My House” by Flo Rida. It looks like Selena Gomez is out of the competition for this week. In seventh place, is “Work” by Rihanna Feat. Drake. Going up from eighth place to seventh, this newer song is creeping its way up to the top. Number six: “Summer Sixteen” by Drake. This is one of the many new tunes on the charts this week, taking its place as number six. Number five is “Hello” by Adele. Surprisingly, Adele’s song is slowly going down the charts: from number one all the way down to number five! For number four, we have “Stressed Out” by Twenty-One Pilots. This catchy song is also going down the charts, being replaced by Justin Bieber’s song, “Sorry”. Number three is “Sorry” by Justin Bieber. Sorry, Justin! This song has gone down from being number two to number three. In second place, we have: “Love Yourself” by Justin Bieber. Justin’s song has finally been bumped down to second by Zayn’s brand new song, “Pillow Talk”! 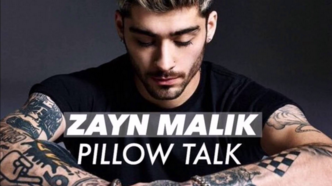 Finally, for first place we have: “Pillow Talk” by Zayn. Unbelievable! Zayn’s new hit just took first place in one week! It looks like “Love Yourself” isn’t the best song in this competition! Tyler and Delaney, Let me know who the Monday music band or singer is and I can play it on the announcements.